Here are some photos of the tiny house I have been working on. It’s currently up for sale to kick start a unique local woodshop. For more photos and info find me on my business Facebook page Humble-Hand Crafts. A custom, owner-built tiny house on wheels in Ojai, California. Built by Humble-Hand Crafts. I love the simplicity. It’s refreshing. Now this is QUAILTY WORK! I love this Tiny Abode ! As a Home Improvement Specialist and Artist/Musician, I see all the Creativity, Functionality and Craftsmanship that has gone into this build ! What excellent work. It wouldn’t take much to extend the length, to allow a bathroom, for those that are wondering. 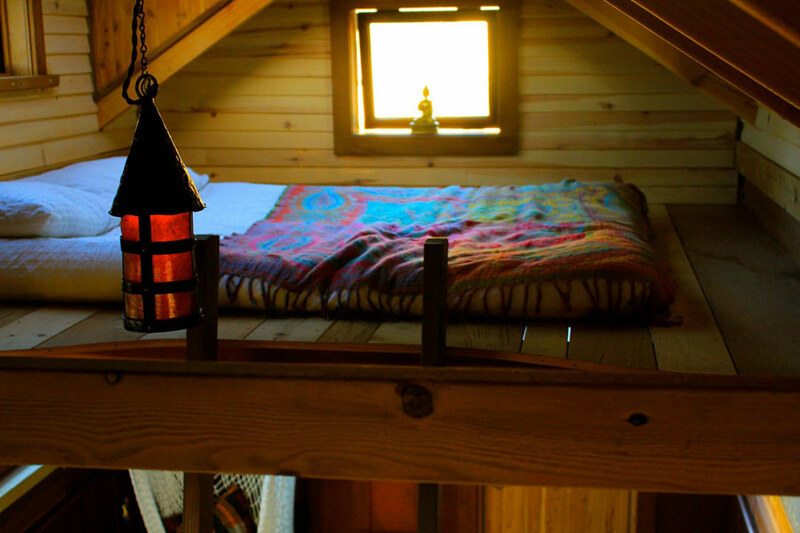 I would be honored to live in a Tiny Abode, such as this ! Bathrooms always seem to be the problem tiny house area. I love the height of the loft on this one. I dont normally like the dark wood but in this one I think it works makes it feel more solid than visually heavy. My idea is to have a 2nd small trailer such as a horsefloat or small towable haul with retrofitted bathroom facilities shower, basin, toilet and laundry area that butts up partially to the main tiny trailer (long side) enough to have a joining doorway/door system through both the main trailer and the wet area small one. Could be a walkway insert that bolts together. I havent figured it out yet but Im always on the look out for ideas. I live in Australia so dont really have to worry too much about rain or snow or the cold but Im thinking some kind of interior insert similar to a mobile walkway to a plane that are used in airport terminals or maybe just an enclosed screen or deck. Im moving back to my land early next year where I hope to save enough money to start building in 2016. My only obstacle is my husband who is not convinced about living in one. As a teacher I will have to work rurally so will need accommodation and rather than pay high rent or the risk of not finding a rental in a remote area I figure having a tiny home I can park on a property is a viable option and even my husband agrees with this at least. So the plan is 2016 and I have told him that Im building one regardless of whether he lives in it or not hahaha! I could see this me living in this one easily………..and my husband rattling round in the main house on his own……heh heh heh! No insulation in the roof? Love the exposed rafter aesthetic – and I suppose this is built in California… but it wouldn’t work quite as well here in Northern Ontario! I love love love these micro houses!!!!! Hope I am on your mailing list!!! 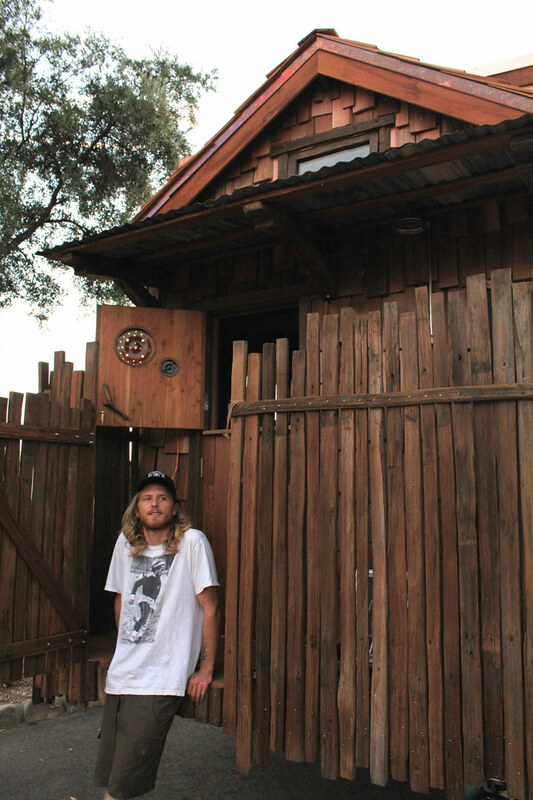 I love how you made this tiny house you….. I find it to be beautiful. honored to live it in Frank? I don’t think it’s intended for living as their is no means to bathe and relieve yourself properly. but it’s a cute handcrafted club house. $60k? seriously? You all are awesome, appreciate the kind words. It looks very well made. I must say though, the wood stove looks quite dangerous! Perhaps it is for looks? That sleeping area is a great touch. I’m totally taking notes! Merci! Nice house! What material did you put behind your wood stove so it can withstand the heat and doesn’t catch on fire? 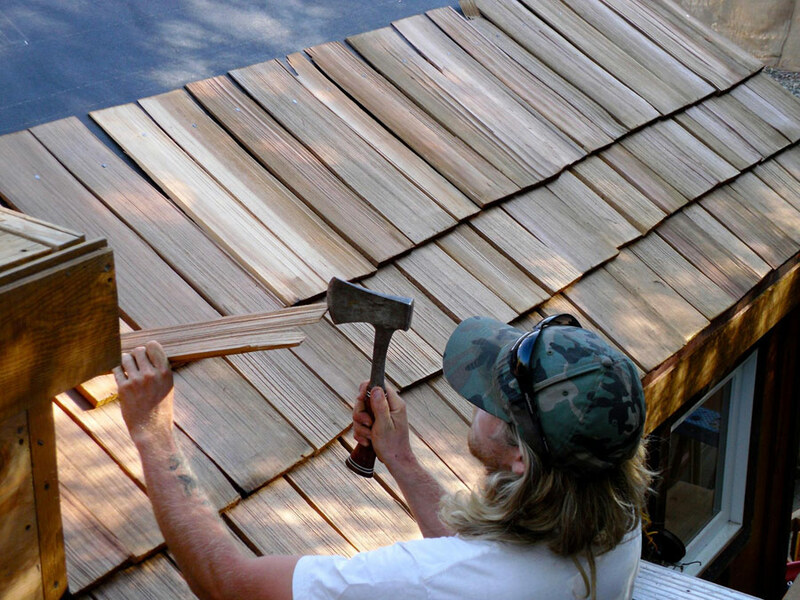 I love it when they mix shakes with wood siding; give a whole wonderful dimension to what could be so plain. I also love his loft. Plenty of head room when you turn over you don’t hit your head! And what could be nicer than a skylight over the bed for stargazing and a delightful casement window, too. (I’m a big fan of casement windows.) And I plan on having stained glass in my THOW. Nice to see that elegant touch in the front door. I like the outside shower on the back deck . I think you may be the first to bring the outdoors in or the inside out. If you had a composting toilet you could have it out side also. Great job something for all of us to think of. This totally appeals to my inner hippie. 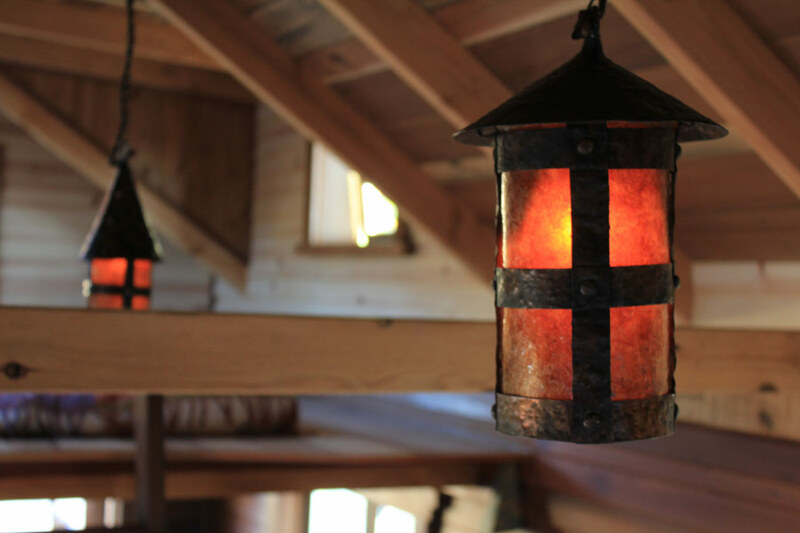 Love the craftsmanship – very nicely done! Omg I love this! 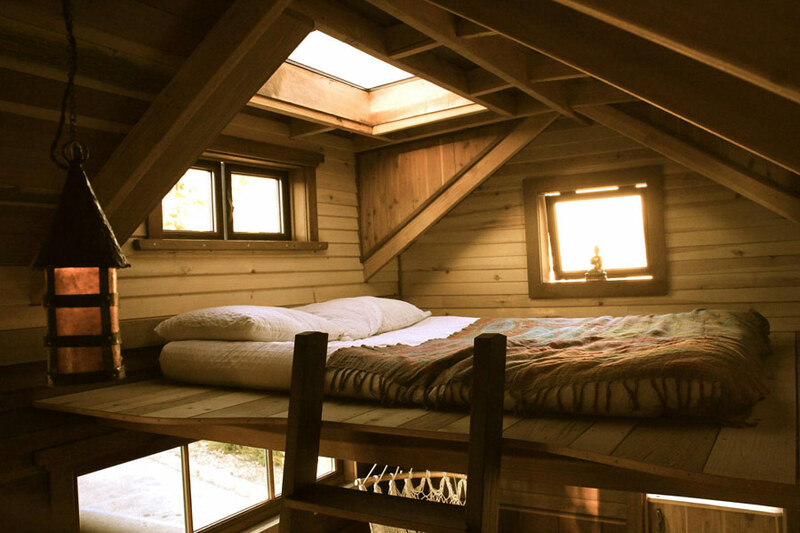 So cozy, especially the loft…that skylight is awesome! Well done!